Tax liens can be an excellent investment. And, in the rare cases when an investor actually does get a bargain property directly from a tax sale, it's usually the result of a successful tax lien purchase. In the event one of your tax lien investment pays off (the homeowner pays the back taxes along with interest to redeem your tax lien), it's likely that you've earned a handsome double-digit return on your money. However, it may surprise you that tax lien investments are COMPLETELY unsuitable for the casual investor or the investor with only a few thousand dollars to invest. Here's why: Contrary to popular belief, tax liens ARE NOT guaranteed by the government. They are guaranteed only by the underlying property with delinquent taxes. If your lien does not pay off, and you receive a property that is worth less than you paid for the lien and expenses, you lose money! And in many areas, 50% or more of the liens offered at the sale are against completely worthless properties. So, this means that you must research all the properties offered at the sale to make sure they are going to be worth more than your ultimate investment in the lien. If you try to "cherry pick" the properties on the sale to cut down on research, there is a good chance that you will only have the opportunity to buy a small fraction of those liens. Even if you invest $50,000 in liens, you would stand to make $5,000 in interest or so, and this barely reimburses you for the time you had to spend researching and the risk you took with your money. Better than a hole in the head I guess, though! A few more things to be aware of: You will need to perform legal noticing to the owner, and pay a lawyer to do so, for your lien to remain valid. You will have to wait many months to several years to get title to the property if your tax lien is not paid off. Ironically, if you do a good job in your research and buy only liens with solid collateral behind them, you will likely obtain NO properties - 95%+ of quality liens that are purchased at a good price, pay off. 1. Do a public records request for a listing of all the liens that were ALREADY SOLD IN THE PAST, and NOT REDEEMED. 2. Find out how long the owner has, to pay off the lien (the redemption period), and see which owners are about to run out of time! 3. Then contact them. A lot of them don't even realize the deadline is approaching! Or, like the tax deed sale property owner, they've given up on raising the taxes and they'll take something instead of nothing. 4. Get out your list of cash buyers, hustle a few over to the property, and put a deal together. No fuss, no muss!" I don't know anything about this, But I want to learn. at what point in a deal that you need to hire a lawyer, in buying a tax lien certificate? There is no need to get a lawyer to buy a tax lien certificate. The thing that you need to be most concerned with is researching the lien BEFORE you buy it. That is the most important thing, I mean, you don't want to buy a lien that no one will ever pay the taxes on like an easement. One of the many reasons I suggest using the strategies above to get properties, NOT buying tax lien certificates. hello, i'm a lil confused, but this sounds to easy to be tru../. step 3 contact the owner, or the lein holder. then I make an offer to buy, is that right..? Pretty much contact the owner, not the lienholder. But yes, all it takes is for you to get out and do it! I wish you luck! They always paid off last-minute for me. understands the situation, and will quiet the title themselves? Have you heard of tax title services? They'll insure title (expensive) without quiet title on many tax sale properties. Not to jinx you, but what are you hoping to get? How long have you been waiting? I am on deedgrabber site but cant find where i need to click to order your course how do I get it? Go on the homepage http://deedgrabber.com. There is a slideshow there with a +1 button, and further down the page there are 10 more, one with each post. Hello my name is Larry I have been buying propertys for years had a heart attact,and stork the same night. I did survrive them and now am getting back in the busness. I am in this class to try to improve my old time straterg As anybody can tell I cant spell worth a crap. but have comfidence I can get in the bussness of buying and selling the tax propertys. Regardless whatever County you buy your tax liens, you will need to do your due diligence on the real estate parcel. if you have the funds you could always pay people to do your due diligence for you. I don't "do" liens - I show you how to get properties that are tax delinquent, any time of year without sales (from the owner, actually). Since you don't have to invest much to either get started on my material or even do a few deals, you really don't have too much to risk. If you aren't willing to risk a few hundred dollars to buy my ebook and do some marketing, then I'm not sure what to tell you. Good luck. I am looking to add tax delinquents to our mailing campaign.....already do absentee and probates. I am strictly a wholesaler and didn't know if tax delinquents lend themselves to good wholesale deals? Yes, they are excellent for wholesale deals and that's all I usually do with them myself. isnt this the same info you are selling in your free and clear foreclosures system without all the bells and whistles.? I really want to learn about this but I dont have enough money hardly for your go ahead and be A deed grabber book and I know I cant afford the free and clear foreclosures system. I would really like to get started on this but I am disabled and have A hard time saving money but I like the fact that I may be able to do deedgrabbing from home. But that money for your book may take me A long time to save up. Much of that is available in the DeedGrabber ebook or Study course, found in the Products section. I am only interested in going direct to the free and clear homeowners that are delinquent in taxes and have no time left and are no doubt going to tax sale. It seems the key here is how to get a list that is short enough to work with that has been weeded out by time. Tie up the property with a lease option or some kind of contract and quickly sell it to an investor for a profit. Let the owners weed themselves out. Too much upfront work trying to make sure free and clear. Just get a hold of as many as you can, and get straight to the point of whether they have equity or not. You'll talk to a lot more sellers, including those with free and clear properties, than if you spend most time deciding who to contact. Just takes a second to chat and hang up with them if not a deal. My husband and i are interested in doing this as extra income, however right now we are only looking to find a property for our enjoyment and raising our children. What do you suggest for someone who isn't looking currently for investment property but for themselves? Unfortunately I only rarely run across property that would be suitable for this, though I sometimes do. Most property needs to be resold to someone who can handle it or has a particular need for it, it's not really in our control what kinds we get when. So you could run the business to make extra income and wait for that "right" property to come, and keep it. If you have some idea what you want, you could also keep an eye out for just that at upcoming tax sales. Depending on what you want (some beautiful land, far from an urban area for example) you may even be able to find a good deal on that AT the tax sale. If the house is for sale with an agent, I usually skip it. There are no states to "stay out of" but make SURE you know what you're doing if you are going to let someone stay in the house that you are buying. I know IL, FL, and WA among others have strict laws that regulate this practice. I don't know of any laws that restrict buying a vacant house that is not the seller's residence. I would love to find out how to buy homes at CHEAP CHEAP prices & double my money. How do i do it? I don't know how you double your money - that would be a bad return. Maybe 10-100X? I like those numbers better. I been trying disect your game plan, it sounds good and creative, but after acquiring deed , is this more like a short-sale. If so, don't you still have to get a approval from where??? Nope - just sell the property. Most properties don't have mortgages, who else would have to give approval? My boss just sent me the link to your website. He is very curious to get more information and just had 1 question. If he buys a property that has both a state and federal tax lien on it, how can he wipe out the federal after he purchases the state lien? The same way? He can't - it's important to make sure there are no such liens on the property before spending any kind of significant amount on them. i need some help with advice please? i live here in texas. there is this property that is next to my aunt. the taxes are 4 years behind heading to year 5. the taxes are totaling $3500. it will be up for auction this coming dec 2013/jan 2014.the owners cant behind found or dont wanna be found. it seeme to be that they dont care. what would happened if i paid the taxes now. would the owner have to pay me back in a timely manner. i wanna get in on this before it goes to auction. can you give me som advise please. Do you think these 2 things can work togather...? Don't you think "the cash buyer list" is also important to DeedGrabbers...? but you did not mention that in your ebook. In Michigan how can you get a deed when you cant find the owners and the bank is also letting the house go back? Can you buy the back taxes when its at the foreclosure sale at the county? You can't get a deed without finding the owners unless you buy it directly at the tax sale. That's what I'd recommend doing if there is a bank involved. If you get a deed from the owner the mortgage will still be against the property. You should concentrate on free and clear properties when DeedGrabbing, and I usually ask the owner very soon after reaching them if there is a mortgage. i go to a lot of auctions every year and i do about 10 a year. all but one had no mortgage liens. I always foreclose on the lender. Do your system have a way of doing away with mortgage. I listened to your training on youtube. Thank you it was very informative. I wanted to ask you if there is a simple way to know if a property is owned outright or if there is a mortgage? Yes - these days you can go to the county website and do a search for the property, and get the owner name. Then go to the recorder's site and search that name for a mortgage. It's not foolproof but you will find most this way. I wouldn't spend time doing that upfront - wait until you get someone on the phone who wants to sell the property. Then get a title report if you don't find anything against the property. Please give us a call during the day if you can at 800-242-5410 and we'll be happy to address all your questions! This goes for anyone else reading these comments too! Rick, your idea of gaining properties through tax deed is brilliant. I would have never thought about such profound way of investing in tax deed. This is sheer brilliance. Thanks Rick. Bob, We've made a ton of money via this method and understand it extremely well! 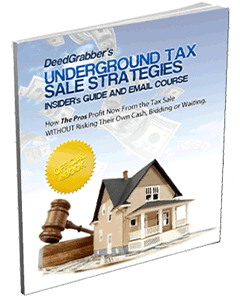 I am interested in the Deed Grabber Course, but yesterday I received a video/webinar with an attorney selling an "Overages" course. Sounds the same to me, almost! Your course is $150 and the attorney's is $1500. They sound almost the same, but I have limited funds and have no income at the present so I have to watch the dollars and find something that will bring in income. Understandable - they're quite different as one deals with buying and selling property, and one is focused on overages. Why don't you ask for Mike or Michelle at 800-242-5410 and they should be able to help. I agree that the buying part is critical but if you need to do noticing or a foreclosure and miss the deadline or do anything incorrectly, you lose all your investment. So I'd have to say that's just about as important.